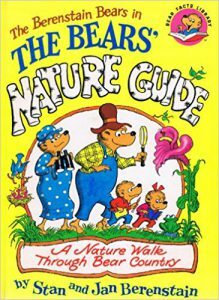 I really enjoyed reading The Berenstain Bears’ Nature Guide as it gives a lot of information for children in an easier format. I think it is a wonderful,educational, and adorable book. It can be used as a introductory science book. It introduces a lot of natural science vocabulary & I think Kids would love to learn about nature in a fun way as the pictures used are colourful and the words rhyme. Bear family goes on a nature walk and Papa Bear introduces animals, plants, and other beauties and wonders of the earth. They learn facts about Environmental Science, animals, plants, and the earth itself. Virtually all children are curious to know what causes the seasons and this book does a great job in explaining all the four seasons and the causes behind the seasons. It explains why we have seasons and then gives information on each season separately. It also gives illustrations along with simple vocabulary to explain why the seasons change & gives ideas of what animals and people do during these changes. Author has done a phenomenal job in showing informative illustrations and text to explain further what is going on in the illustrations. I think that showing the children in the book experiencing each season makes the reader feel as if they are apart of the journey. I also love that this book has s a lot of pictures! Some pages have smaller pictures and other have pictures that take up the whole page. This book also has some pictures of different settings during the seasons. I like that each season has its own section of the book & some interesting facts about each season. It talks about some of the good & bad things each season brings with it. You can read about one season a day or a lesson so it does not get confusing for the kids. The Berenstain Bears’ Nature Guide could also be a great tool for introducing kids to matter(Solids, Liquids & Gasses). It introduces the three states of matter and describes the unique qualities of each. And for each state of matter, the book includes an activity to help kids learn. This book further explains What is Energy, where does it come from, the various types of energy and finally how can we save it! Overall, it was a great, informational read on some big concepts that I was able to refresh on myself. The illustrations are beautiful and the book is perfect for kids to understand, especially when the topic is new. I highly recommend this book to parents & teachers! Give your child an access to The Berenstain Bears’ Nature Guide and over 20,000 more great books for free for two months! Click on the banner below and use the promo code Jedlie to try Epic for free for two months.